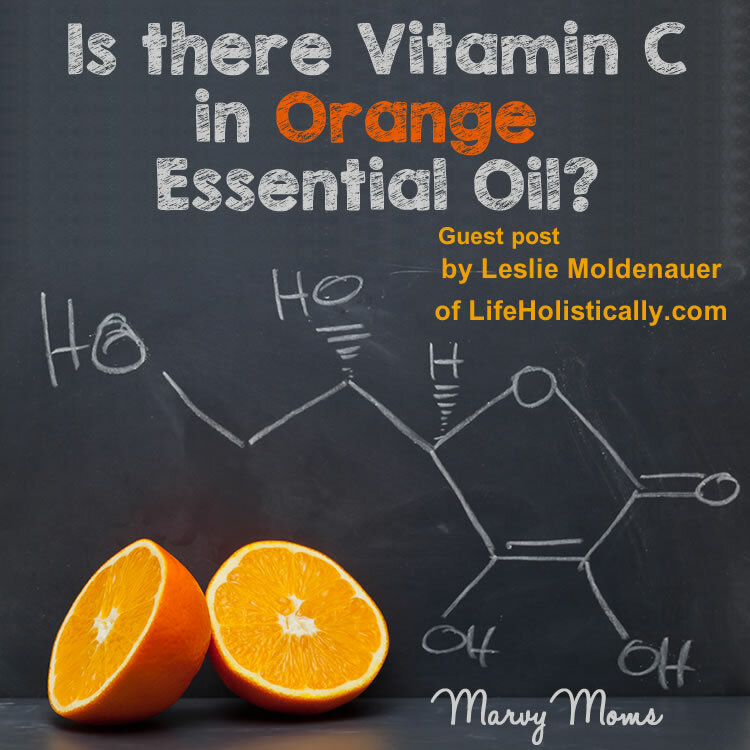 Is there Vitamin C in Orange Essential Oil? A few months ago I wrote an article called, “21 Scariest #oilybaby and #oilybabies Hashtag Shares on Instagram.” Number 20 on the list was a video with a caption that read that as part of her daily routine the mom put “2 drops of Orange on [her son’s] belly for a vitamin C boost.” As I was asking for references while I was writing the article, Leslie Moldenauer of Life Holistically offered to dig even deeper to bring you the article below. There is no shortage of information found online regarding the therapeutic benefits of essential oils. The issue comes in when we need to decipher the validity of what we find. There are many things that have scientific proof, and others that do not. One such thing that does not have scientific proof is the presence of nutrients in essential oils, specifically vitamin C (L-ascorbic acid). In order to answer the question of, “Is there Vitamin C in Orange Essential Oil?” we need to talk about the chemistry of essential oils as well as that of vitamin C.
There are vast differences between essential oils and vitamins in regards to their solubility. Essential oils are not soluble in water. Essential oils are lipophilic (fat loving), also called non-polar substances (but they are not actually fats). In contrast, Vitamin C is a water-soluble vitamin and is hydrophilic (water loving), also called a polar substance. As a general rule, polar substances will dissolve in polar solvents and non-polar substances will dissolve in non-polar solvents. This confirms the fact that water and oil do not mix. Next let’s talk about essential oils and volatility. All essential oils are volatile. What does this mean? Volatility refers to the ease with which a substance will evaporate, or at which rate a liquid will turn into a vapor. Certain essential oils, such as the chemical family of monoterpenes, have smaller molecules. Monoterpenes have 10 carbon atoms (found in cypress, sweet orange, and lemon) and will evaporate quicker than sesquiterpenes which have much larger molecules and 15 carbon atoms (found in patchouli, sandalwood, and vetiver). With only 6 carbon atoms, Vitamin C is a relatively small molecule in comparison to that of both monoterpenes and sesquiterpenes. Vitamin C is a polar molecule and is very volatile, making it soluble in water and completely insoluble in non-polar solvents such as essential oils. It is important to note that essential oils do not require heat to evaporate. 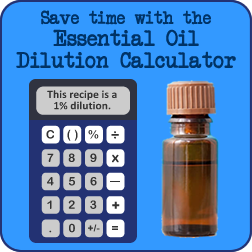 Although essential oils can evaporate at room temperature, higher temperatures will result in accelerated evaporation. The most common method for extracting essential oils from a plant is using heat in a process called steam distillation: the steam of boiled water passes through plant material and is then cooled to collect the essential oil. This process is typically performed at temperatures less than 100° C/212° F, as a temperature hotter than this will increase volatility. Vitamin C degrades at 70° C, which is lower than that of the steam distillation process (Researchgate), and therefore will not be extracted with the essential oil. Most, if not all, of the vitamin C content will either be destroyed or left in the water through the steam distillation process. I have seen discussions on social media where the benefits of herbs are assumed to be the same as essential oils. We cannot make that assumption. One example of this is with the herb fennel. Fennel can be consumed as a tea to stimulate breast milk in nursing mothers. Fennel essential oil, on the other hand, does not increase milk production and is actually contraindicated for nursing mothers. Another example is with the herb cilantro. Cilantro the herb may be helpful in chelating heavy metals from the body, however, the essential oil does not have this capability. Plants in their whole form contain various nutrients, vitamins, and minerals which are destroyed or left behind in the distillation process. The next important point is that of molecular weights of essential oils versus vitamins. Molecular weights vary based on the actual size of the molecule. These weights are measured by g/mol (molar mass). Essential oils have a relatively low amu, with the class of monoterpenes being the lowest, and sesquiterpenols being amongst the highest (A range of 100-300, approximately). Vitamin C has a molecular weight of 176.12 (PubChem). There “may” be a very minute amount of vitamin C in an expressed essential oil (Different method of extraction than steam distilled), but not enough to be significant to our daily requirement for health. Smokers Individuals who smoke require 35 mg/day more vitamin C than nonsmokers. Taking this into consideration it is easy to see that utilizing essential oils in hopes of getting your RDA of vitamin C, or even a fraction of that value, is fruitless. The best source of Vitamin C is from food. Real citrus fruits are your best bet, as are strawberries, leafy greens, and broccoli. Do not rely on essential oils to obtain nutrients. Doing so is a waste of time and money. What’s your favorite way to get Vitamin C into your body? Read more articles on Marvy Moms about essential oils! Sign up for email updates to always get the latest essential oils articles. Leslie Moldenauer has completed her aromatherapy training through the American College of Healthcare Sciences, where she is earning a degree in Complementary and Alternative Medicine. Leslie serves as ambassador to her school and was recently chosen as a featured student. She has recently begun contributing to the Tisserand Institute blog as well as the blog for her school. She is an essential oil safety advocate and holistic health blogger at Life Holistically and on her Facebook page. When not studying or writing she spends her time cooking, practicing yoga and meditation, and is a graphic designer. I was diagnosed with Interstitial Cystitis and have other chronic inflammation in my body…joints…thyroid in addition to the IC. I use essential oils daily and have been for about a year now. However, I have chronic UTI’s and have been told I need to increase my vitamin C intake. Can you tell me if you know of a form of vitamin c that would not aggravate the inflammation in my bladder? Jean, the first line of defense for decreasing inflammation in the body is through food choices. There are several anti-inflammatory diets floating around out there. The one I’ve personally tried is the Whole30. I’m betting you can get the Vitamin C you need through food as well. The article above lists some good choices for accomplishing this. A good naturopath would be able to help you supplement if necessary and guide you in the direction of a food plan for your individual needs. Just wondering if using citrus oil on my face will be good for my skin as I have heard about the benefits of vitamin C for facial skin quality?